I think nesting can occur in an "expecting" husband as well as the wife. Today we're at 40 weeks. 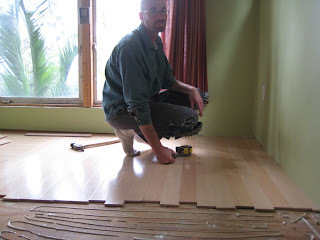 Two days ago Ryan decided to put new flooring in the baby/office area. 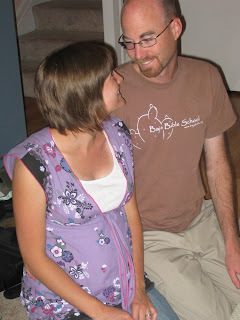 We'd talked about doing it before the baby came but life has been busy so I assumed it'd occur sometime down the road. Nope. It's in and thankfully the baby didn't decide to come while construction was under way. Ryan actually slept in this crib. 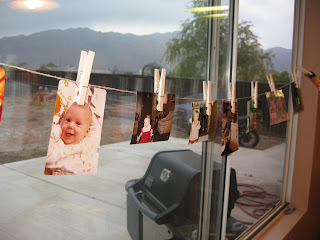 His parents had saved it and it made its way from Washington to Northern Mexico! 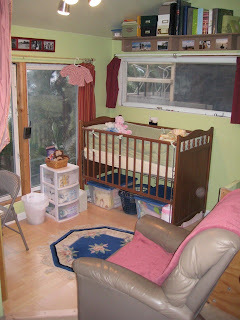 The baby's area is really part of our bedroom/office loft. It's pretty common here to share living space so that's what we'll do. 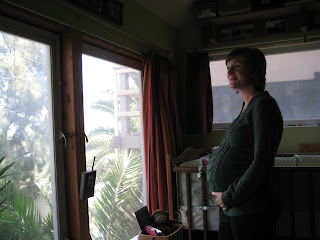 She'll be spoiled because we have an amazing view of the city (both Tijuana and San Diego). 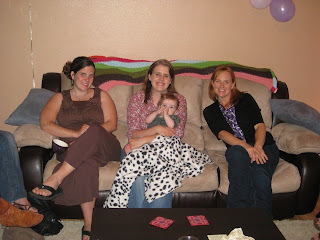 A few weeks ago my sister Melissa had a little get-together at her house. It was such a great mix of people! 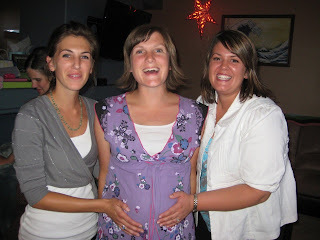 My sister, Erika and sister-in-law, Michelle both flew in from Oregon. A few of our staff girls drove up from Tijuana and the rest of the guests were friends from Melissa's church. We're only 1.5 hours from Mike and Melissa so we've gotten to know several families in their church; they're such a neat group of people. I feel really blessed to know such quality women from all over the west coast. Our baby received lots of love this weekend! 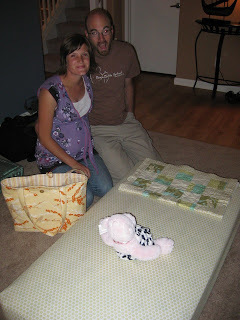 We received some great gear...the church ladies pitched in for a crib mattress, Ryan's mom made sheets & a diaper bag, Lyndsay made a matching quilt, and Michelle made a changing pad that matches the diaper bag (not pictured). The bear is sporting the cow print diaper! 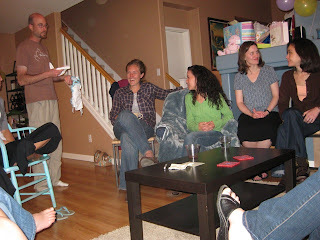 Ryan did a fascinating demo the the cloth diapers that we had just purchased (you can see that Heidi was entertained). 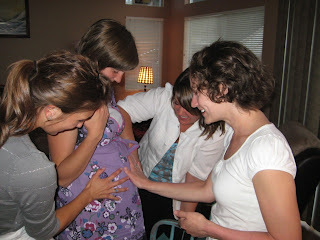 Since being pregnant, one of my favorite places to visit is our friend's home for boys. I try to get over there once a week and each time there are pats on the tummy and questions about when the baby will be born. 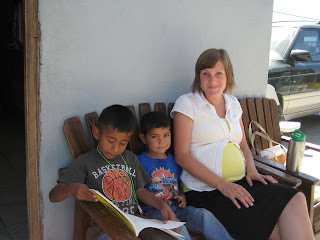 Many of the kids have younger siblings and are very familiar with pregnancy and babies. My favorite interaction took place a few weeks ago. The little boy sitting right next to me, in his 4-year old way, thought he could see the baby if he looked under my shirt. I explained that she is still inside my tummy but when she's ready she will come out and he'll be able to see her like the other babies he knows. He looked at me with big eyes and asked, "sale de la boca?" For non-Spanish readers, he asked if she's going to come out my mouth. I told him "no" and thankfully he left it at that.